Summer as a teenager was a nightmare time of year for me. 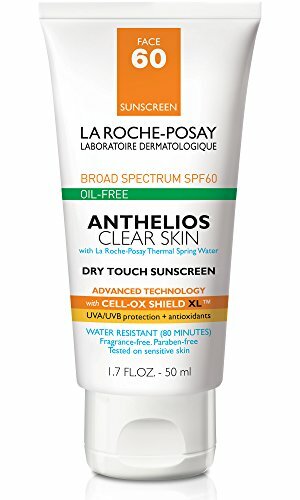 Heavy sun creams that offered protection from burning would clog my pores and make my acne so much worse. As an adult I’m still prone to acne but fortunately sunscreen products have advanced and are now more friendly to my acne-prone skin, and can even be worn with my face on for a glam day at the beach. The best sunscreen for acne-prone skin should offer adequate protection from the harmful rays of sunlight yet be gentle on your skin enough not to cause further breakouts. Lightweight, oil-free products will help keep your clear skin and not clog up those pores. Other sunscreens may even include ingredients that actually fight the build up of oil or dirt that causes acne and keep your skin looking clean and fresh. If you experience acne issues, you probably already know how hard it can be to find skincare products that don’t aggravate your breakouts. Sunscreen is no exception, suffering from breakouts you need to choose sunscreen products that are specifically designed for acne-prone skin. Let’s take a look at what makes up the best sunscreen for acne-prone skin. Antioxidant technology protects from UV rays and free radicals that cause premature skin ageing. Oil-free sunscreen with anti-shine complex that absorbs pore-clogging oils throughout the day. High broad spectrum SPF 46. Antioxidant content to repair the skin and protect from free radical damage. Broad spectrum UVA/UVB sunscreen uses 10 percent zinc oxide and 5 percent titanium dioxide. Gentle for sensitive skin and dermatologist recommended. Large 8.75-ounce bottle, works out cheaper per ounce. Infused with vitamins and antioxidants which help to rejuvenate skin. Fragrance and paraben free, suitable for sensitive skin. Oil free, non comedogenic, kid friendly and water resistant. Acne used to be thought of as mainly an adolescent problem, just to add to those other confusing issues as our bodies change (gee thanks, mother nature!). But recent studies have shown that over 60 million people in the U.S. suffer from acne with the average age of an acne sufferer having risen from 20.5 years old to 26.5 years old. And to make matters worse, we women make up 80 percent of adult acne cases. Makeup products that we use can often lead to breakouts and there are many products now designed that cater especially for acne-prone skin and are non pore clogging or oil free. Ensuring a good cleaning routine and complete removal of makeup can also help reduce those breakouts from getting worse. But how much thought have you put into your sunscreen choice? Acne-prone skin is nearly always accompanied by oily skin, most sunscreens add an extra shine or grease to the skin definitely not needed. Titanium oxide and zinc oxide are particularly effective in treating acne on oily skin and you should try to avoid chemicals or oils that may further irritate your acne. The other important consideration is the protection the sunscreen offers you. Many of the medications or formulas that we use to treat acne can make our skin more vulnerable to sunburns, especially the facial area. You’ve probably seen the labels SPF 15, SPF 30 or even SPF 50 on most bottles of sunscreen, but how do you know what they mean and which one is high enough? SPF is an acronym for sun protection factor and as it suggests is a measure of the sunscreen’s ability to fight harmful UVB radiation from the sun. Generally a higher SPF offers more protection from the skin damaging UVB rays of sunlight, with an SPF of 30 offering 97 percent protection and SPF 50 offering 98 percent protection. But SPF only protects from UVB rays, not the other harmful UVA rays we also get from the sun. Skin damage is caused by both UVA and UVB rays, although the UVB rays do considerably more damage. Most of the best sunscreens for acne-prone skin now offer both UVA and UVB protection through filters that are labeled multi-spectrum or broad-spectrum sunscreens. The addition of UVA-fighting ingredients including zinc oxide, titanium oxide, avobenzone or oxybenzone enable them to offer protection from both UVA and UVB rays for more complete coverage. The following YouTube video from the FDA further explains how sunscreens work. We’ve looked at many of the top-selling sunscreens to find in our opinion five of the best sunscreens for acne-prone skin. Patented technology used by La Roche-Posay combines a broad spectrum maximum sun filter of SPF 60 with a powerful antioxidant complex to further protect the skin from UV rays. The anti-shine complex uses perlite and silica for a blotting effect which absorbs those pore-clogging oils even in humidity and heat. (It’s clinically proven to reduce shine and oil appearances by 46 percent.) This is an oil-free compound with a dry touch texture that gives a matte finish. High SPF for maximum protection. Free of fragrances and parabens. Dermatologically tested for use on sensitive skins and won’t cause breakouts. Dry touch lotion can feel chalky and may not blend well. On combination skin it can leave a white residue that turns powdery. May not stay matte all day due to oil-absorbing properties. Can cause clumps or streaks in makeup. 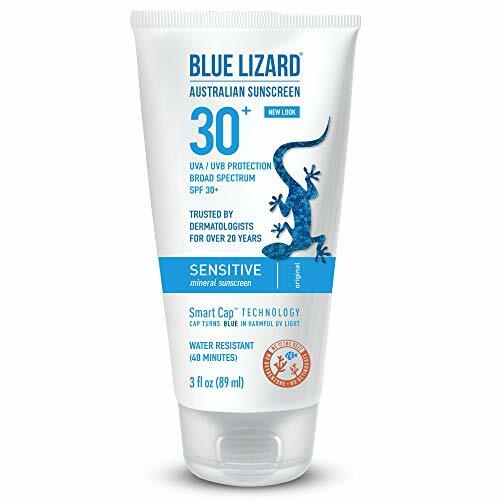 For anybody looking for a sunscreen specially formulated for sensitive acne-prone skins, this product also helps to rejuvenate skin damaged by acne. 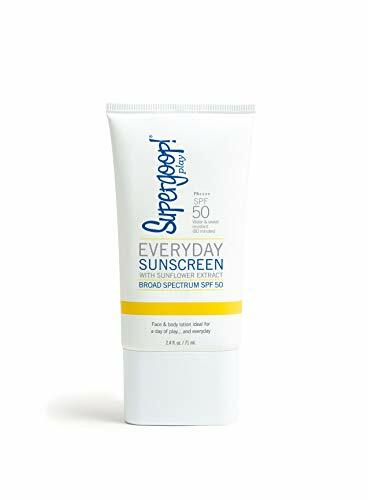 With a broad spectrum SPF 46, this sunscreen also uses antioxidants to protect from free radical damage associated with UV rays and infrared radiation. Fragrance free and oil free this sunblock is easily absorbed into the skin, but isn’t resistant to water and sweat meaning you have to reapply regularly. Won’t cause blocked pores or breakouts. Mild formulation is great for sufferers of rosacea while offering protection. May sting and burn if it gets in the eyes due to zinc oxide and hyaluronic acid content. Some users find it leaves a white cast on the skin. Not a standalone treatment for acne. Best used in conjunction with other products if your breakouts are more severe. Formulated for people who suffer from acne, this sunscreen offers powerful protection from harmful UV rays while being gentle enough for use on sensitive skins. Free of harmful chemicals, fragrance and parabens it soothes redness of the skin and burning. A unique smart bottle turns blue when harmful UV rays are detected reminding you to apply the sunscreen. Zinc and titanium provide protection from harmful UVA and UVB rays. Gentle for sensitive skin on both face and body. Lasts a long time even when in and out of the water. Some users complain it doesn’t absorb quickly. Wide opening at top of larger bottle means you often squeeze out too much. Like all zinc oxide products this sunscreen can leave a slight white cast. Smart bottle technology is gimmicky and not really of use. A super broad spectrum SPF 50 offers protection from UVB, UVA and infrared radiation to the skin. This water-resistant, oil-free lotion easily absorbs into the skin and is well suited for more active lifestyles or a day at the beach. The formula is a mineral sunscreen including olive polyphenols which are rich in omega-3 and omega-6 fatty acids to help strengthen weak, irritable skin and prevent acne breakouts. Water resistant with high SPF 50. Provides longer protection for your skin. Mineral formula sits on top of skin which is better for sensitive or acne-prone skin. Cellular response technology provides tools to repair your skin over time. Very thin formula that easily absorbs means you'll use a lot. Leaves slight sheen to skin so you may need to put some powder on top if not wearing makeup. In our opinion, the trusted skincare brand name, value for money and dermatologist recommendations make Neutrogena Clear Face Liquid Lotion Sunscreen for Acne-Prone Skin, the best sunscreen for acne prone skin. With a high SPF 30 it should offer enough protection for most skin types if reapplied regularly (a must with all sunscreens) without causing too much buildup that results in embarrassing breakouts. Not only can you help keep that skin clear of acne, but the Neutrogena sunscreen will protect against the ageing effects of the UV rays and keep you with a healthier, younger-looking appearance. This sunscreen is also free from oil, fragrances and PABAs, making it the best choice for people with acne-prone skin. What is the Best Concealer For Acne in 2019? What is the Best Foundation for Acne in 2019? What Is the Best Moisturizer for Acne Prone Skin?